Golf lovers, you have come to the right place! Within a 15km radius you will find no fewer than 7 superb golf courses (that number shoots up to 17 within an hour’s car drive). You can play all year round thanks to the Basque Country’s temperate climate. The region boasts a rich historical golfing background (Le Golf du Phare is the oldest course in France!) and, over time, has become Europe’s golfing mecca. As we were saying, Le Golf de Biarritz-Le Phare is the oldest and, without a doubt, the most iconic golf course of the region. This 18-hole course, located in the heart of the town just a short putt from the clifftop lighthouse, was redesigned by the architect HS Colt in 1920. This par 69 and 5.4km golf course is an absolute Must. Biarritz also has the Ilbarritz International Training Centre, with its awe-inspiring panoramic views over the ocean and Basque mountains. With its 26 golf schools, players of all levels can perfect their skills, both beginners and professionals, and enjoy the exceptional surroundings. A little further north, once again by the ocean, discover the 27-hole Golf de Chiberta, in Anglet. This golf course was designed by the great Tom Simpson in 1927 and features both seaside links and inland holes laid out in the woods. Golfers can choose from a par 70 course (5.6km) and a par 29 course (1.4km). Change of atmosphere with Le Golf de la Makila in Bassussary. 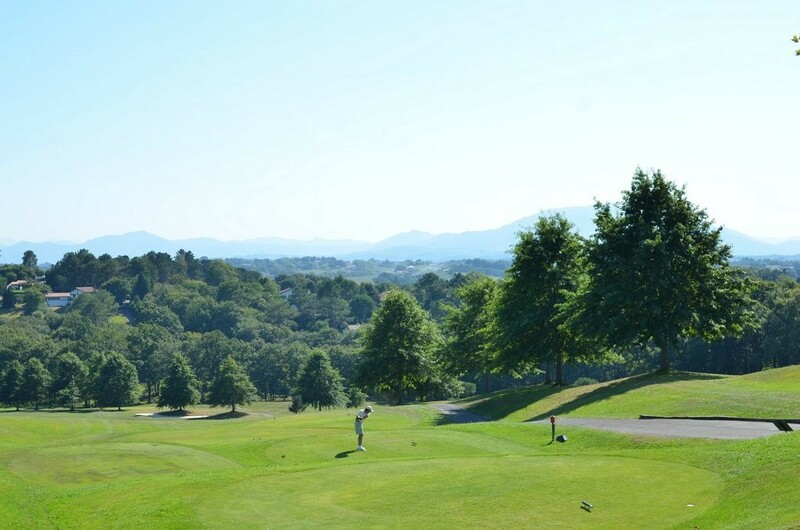 This 18-hole course is located a few kilometres away in an undulating setting with stunning views of the most famous Basque mountain, La Rhune. This par 72 course (6.2km) was designed by the American architect Rocky Rockemore and its wide fairways and variety of holes are ideal for golfers of all levels. A few kilometres away, the Golf d’Arcangues is famous just as much for the quality of its course, designed by the American Ronald Fream around the Château d’Arcangues as for its magnificent views over the whole Pyrenees mountains right down to the ocean. This par 72 course is spread over 6.1km. If you venture south, you can discover two golf courses in Saint-Jean-de-Luz, Chantaco and La Nivelle. Le Golf de la Nivelle rolls through a very hilly landscape and offers scenic views of the mouth of River La Nivelle and the town of Saint-Jean-de-Luz. The club and its warm welcome are greatly appreciated and well-known in the region. If you feel like expanding your explorations of the Basque Country a little further, then we recommend an authentic experience at the countryside golf course Epherra in Souraide, a lovely village amid the hills of the inland Basque Country. Don’t miss out on the owner’s traditional cepe mushroom omelette while you’re there! Last but not least, keep in mind that Les Landes also has many golf courses that are very close by: Le Golf Club d’Hossegor and Le Golf de Seignosse. For that matter, there are special prices available in Seignosse, Arcangues, the Makila and Biarritz-Le Phare via the Golf Pass Biarritz Côte Basque.